NOTE: this is a guide to grooming trails right after a big snowfall. Once packed and frozen the trails are open for all to use: bikers, skiers, runners, and hikers. With that in mind, here is the most important goal: Always Pack the Center Line! Follow the same line you ride all year long. Pack as if you are on your bike riding the line: don’t go around fallen branches, clean them up (shake snow off or cut). Each pass you make with snowshoes you should be packing and reinforcing the center of this line. In the illustrations the line is represented by a fat tire track. This is a snowshoeing pattern. This does not pack the line. Do not snowshoe. Instead, use your snowshoes to pack. That is packing! Half steps, snowshoes close together … stomp if you’ve got the energy. “Oh, man, that’s going to take forever!” you groan. It is slower, but you are accomplishing the goal and getting closer to riding again. We’re going for quality, not quantity. Trust me, it’s much better to have a few miles of rideable trail than miles and miles of crap no one can ride. If you are going to spend time on snowshoes make it count! For the second pass we offset the packing pattern 3-4 inches to the left or right. You’ll see a ridge of snow down the middle of the trail from the first pass, which this pass will pack down nicely. It’s tempting to go way off to one side or the other and really widen the trail, but that’s not packing the line. Remember: Always Pack the Center Line! Snowshoes range from 8 to 10 inches wide. After your first pass the trail is going to be 16 to 20 inches wide. When you offset four inches your inside foot will be packing the line while the outside foot is widening the path, which will now be 20-24″ wide. Note: this second “pass” could be a second person in the packing party. 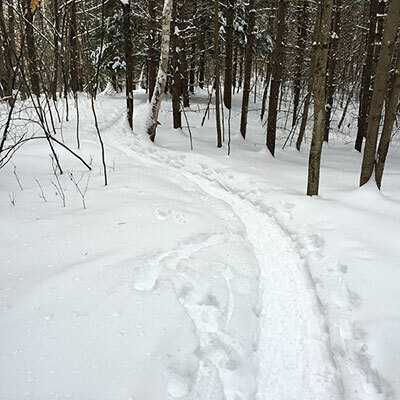 Skiing the trail – looks nice, but not good for packing: skis spread your weight over a larger area than snowshoes and even the widest don’t cover much area. Good for smoothing an already packed trail. Pulling a sled or tire – this doesn’t pack the trail, it smooths it out, which is great if the trail is already well packed. If the trail isn’t packed you’ve just obscured which parts ARE packed and made it much harder to ride. Jogging and hiking – put some snowshoes on those feet and pitch in! You’ll be enjoying a well packed trail with the rest of us.